edit your transactional emails in your browser. Sandiapp does two things, it receives technical notifications from your AWS SES account and let you explore it and prevent bounce & complaints. It let you edit and design your transactionals emails at any time right in your browser and send your emails trought our api. By exploring your sending statistics to detect boucing emails or complainings user you'll be able to stop sending email to their account and get a better sending rate. And so to reduce your the number of emails you sent each day. Create your transactionals email templates in your browser and edit them every time you need. Or give an access to your clients so they can manage their emails'content while you focus on the tech. 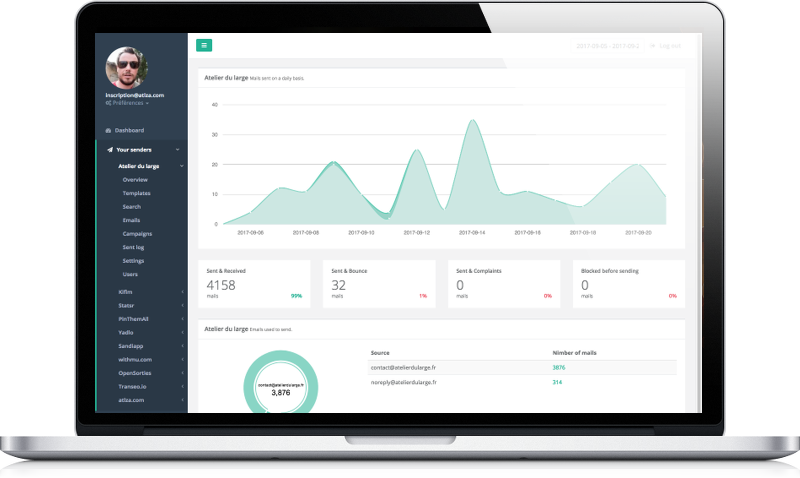 Sandiapp gives you full analytics about your emails. Who reads? Who opens? Which emails are invalid? It also helps you design better transactional emails with an easy to use built-in editor. Sandiapp helps you monitor your mails sent with Amazon SES. See delivered mails, bounce & complaints. Use our API to check email address before sending your email. Create and edit your transactional emails right into your browser. HTML email templates are complicated to create and maintain. 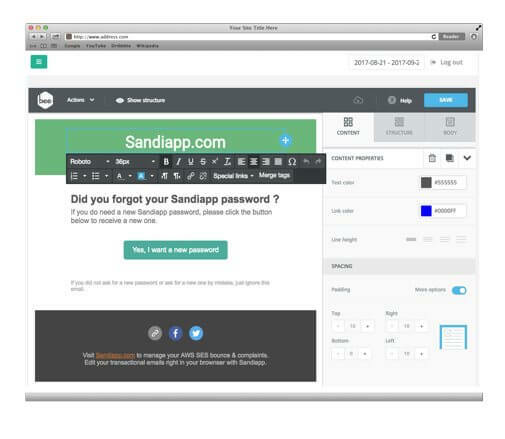 Sandiapp has a built-in and easy to use template editor. Are you an agency? Give access to transactional emails to your client so they can edit emails' text and design by themselves. Templates created with our editor can use variables, so you can include customs links, codes or any variable text you need. SandiApp is a service provided by Mu. We love SaaS and try to focus and make people's life easyer. Don't doubt in contacting us, we speak French, Spanish and english.